Scenario: a small bird flushes up from a scrubby area. It pauses out in the open for a few seconds. You raise your bins and madly work the focus knob to try and get the bird in focus. Within a few seconds, it flies a short distance, lands, then disappears into thick cover. Your identification is ‘unknown species.’ A field blunder, especially problematic in bush-birding scenarios: forgetting to pre-focus by preparing your binoculars for focus at close range. Pre-focusing is a skill that is learned by becoming familiar with the extent and range of your focus knob. You can even practice this while on the couch! The key is learning to adjust the focus without looking through the binoculars. You don’t have to get the focus exact by any means; getting somewhere relatively close to the ideal focus is the key. For bush-birding, I find the best starting point for my Nikon Monarch 5s is about 1/5th of the way between close focus maximum and infinity. 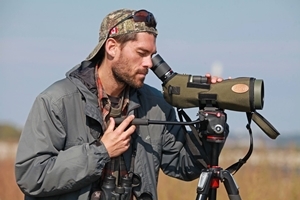 This way, if a bird pops up about 20-30 feet in front of you, the focus “sweet spot” is quick to find. Pre-focusing equals less time spent fiddling with the focus knob and more time identifying the birds in the field. 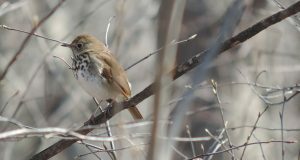 Photo: Hermit Thrush. Maple Hill Park, Ottawa, Ontario. 24 April 2014. Dunne, P. 1998. Little tricks of the trade. Birding 30(4): 333-334.